Oppo N3 has the world best fingerprint scanner such as Hauwei Ascend Mate7. So far as, it provide screen scroll and camera contol. Up to five to be register, It provide convenient SW and then guest mode. No one can say how good aphone really is until he uses it himself. Also, different people have different opinions and views about different phones. There can be no comparision in it. AnonD-80594, 31 Oct 2014Oppo should release a PLAY EDITION for this phone. It would be extremly awesome to see it on G... moreYes the N3 on Google official ROM would be a great buy. ColorOS is utter garbage, people who have swapped to cyanogenmod are getting instant battery life improvements by huge margins. Latest & greatest specs? Nope, doesn't matter. I use to think that to have a good experience, you needed the latest device. Bunch of hogwash unless you into tweaking every last bit of performance to gain a point or two in benchmarking programs. My "cheap" 300 dollar Mate2 may not look pretty, may not have the top flight innards, but it WORKS and it sure didn't cost $650 bucks either. People are being duped by these flashy phones with their INSANE prices, for what? 99.9% of the stuff that you can do with one of these things, I can do on mine pretty much at the same rate, same speed. I just don't get it why people want to waste their money. wait, it doesn't have a 3.5 mm earphone jack? Oppo should release a PLAY EDITION for this phone. It would be extremly awesome to see it on Google ROM. "The camera has been improved as well. It uses a 1/2.3" CMOS sensor with a 16MP resolution, Schneider Electric optics". WAIT...WHAT? Schneider Electric? Not Schneider Kreuznach? 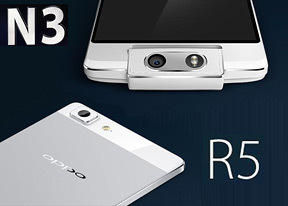 Oppo R5 is so thin, 2 of them can literally fit in a N3. take note that N3's width is like less than 10mm. Oh man, that is dope! But really, what is suffering here is the battery. 2000mAh bat is soooo bummer for R5. And there's this BendGate thing again. You want a good cameraphone? Look no further than Lumix CM1 only thing done right but it's bulky that's the tradeoff. You are not going to defy the nature of semiconductor physics and still have small sensor size and have DSLR like quality. AnonD-259899, 29 Oct 2014It seems you maybe correct, saw the ausdroid link, but am sure I read somewhere it's a sony se... moreIts not just on the ausdroid site. Its literally everywhere if you know where to look. Sonys not the only one making camera sensors you know. This OV variant got an even bigger micron size compared to the IMX220 you were earlier stating.16mp on a 1/2.3 in. sensor at 1.34?micron size is top of the line. I just dont have faith in Oppo anymore. I own the Find 7a which has an IMX214 sensor but the software is horrible. The software engineer that designed its UI and algorithm should go back to sunday school. I regretted selling my LG G2 for this Oppo piece of crap. From here on now, its just only LG, Samsung, Htc or Sony for my next android. No more experimenting on non established brands. The support and peace of mind you get from well known brands cannot be understated. AnonD-325369, 29 Oct 2014Man you are totally wrong here. The sensor in the N3 is made by Omnivision. Not Sony. Check ... moreIt seems you maybe correct, saw the ausdroid link, but am sure I read somewhere it's a sony sensor. They've tapped a Sony sensor for R5 with the IMX214. Need more proof than one source while others don't seem to report on it. Either way the point is made, the larger sensor only will pay dividends if the software is upto scratch. AnonD-259899, 29 Oct 2014Sony Z1/Z2/Z3 ---> 20.7 MPix at 1/2.3" Sensor size (made by Sony) Oppo N3 ---... moreMan you are totally wrong here. The sensor in the N3 is made by Omnivision. Not Sony. Check you facts first before posting your intelligent critique. Also i believe Omnivision is the one commissioned by HTC to build their Ultrapixel cameras. The first generation was sort of a mishap but the 2nd gen ultrapixel is getting it right. Also many front cameras are made by Omnivision. They just dont have the market capitalization that Sony has with their sensors. The one i'm really worried about here is the TFT display. It's a really subpar display technology that washes out colors and gives poor contrast and viewing angles when compared to IPS or OLEDs. I don't know why Oppo opted for the TFT here but it's really a dealbreaker for me. Also they didn't go for the S805. This is still the S801 @ 2.3ghz mind you not the top of the line 2.5ghz variant. All the other specs are ok-ish for a supposedly flagship product. 3000mah battery, 5.5in FHD (albeit TFT), good material choices and the gimmicky O-click. I was hoping QHD display like FIND 7. Other wise compare to price such spec are OK note 4-$900 and N3 is $650. Anonymous, 29 Oct 2014Same screen as Oneplus One, 'cept OPO is better.Yup OPO has the JDI screen which has a similar tech found on the G2, 'GRAM' for saving power while showing static elements. My future new phone.. cant wait!